The word Disneyana has been used casually since the 1960s and was probably first used in Malcom Willits' collector's book store mail order catalog. However, it was in 1974 with the release of a book called Disneyana: Walt Disney Collectibles by Cecil Munsey that the term really came into use. In 1976, Disney opened the Disneyana Shop at Disneyland in Anaheim, California. It sold all types of Disneyana including vintage items. The store was closed between 1986 and 1998 and when it reopened, it no longer sold vintage items. In 1979 a meeting of twelve Disney collectors formed a club in Anaheim to celebrate Walt Disney. It was called the Mouse Club. In 1982, they held the first unofficial Disneyana Convention at the Jolly Roger Inn across the road from Disneyland. The number of Disney fans grew rapidly in the 1980s and 1990s and today you can find Disneyana items everywhere including at your local mall, online, at auction and at antique shows. 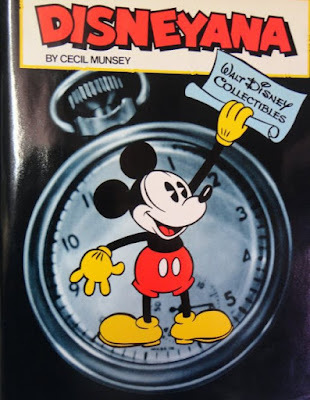 Disney increased the amount of collector merchandise it was releasing throughout the 1980s and in 1992 held the first Official Disneyana Convention at the Contemporary Resort, Walt Disney World. Today there is a lot of Disney merchandise available in a wide variety of quality and desirability. The items produced during Walt Disney's lifespan between 1901 and 1966 are generally more valuable but many people collect new as well as used and vintage Disney pieces.